When you need fast, effective offshore helicopter transport to oil rigs in the Gulf of Mexico. Currently, there are more than 200 oil rigs operating in the Gulf of Mexico. Offshore oil rigs enable the oil and gas industry to access these vital fuels via drilled wells. The Gulf of Mexico and the North Sea are the two primary locations for oil rigs in North America and helicopters are a crucial lifeline between them and the mainland, transporting equipment, cargo, crews and more. When emergencies strike, helicopters become more indispensable to the men and women isolated out on the rigs. FairLifts can help arrange VFR and IFR operations for commercial clients in the Gulf in addition to on-demand helicopter lifts and charters when the need arises through our growing partner network of professional offshore helicopter services in Gulf Shores, Alabama. Gulf Shores, Alabama is located along the picturesque Gulf of Mexico. Of course, this vacation hot spot is well known for its stunning beaches, trails and sea turtles that live along the coastline. However, the Gulf of Mexico is also the heart and soul of gas and oil production in the United States. It is home to more than 200 oil rigs and the crews that staff them. Crews typically work extremely long hours for 14 days before returning to the mainland for a much-needed respite. Helicopters are the salvation for people stationed on oil rigs, getting them to and from their jobs safely and quickly. Gain access to an array of offshore helicopter transport options to the Gulf of Mexico in Alabama. When your business is located far from the mainland in the middle of the Gulf of Mexico, helicopters are the most efficient way to transport people, equipment, supplies and more back and forth. Gulf Shores, Alabama is at the center of the oil and gas industry in the Gulf of Mexico. When you have to transport crews, require an emergency evacuation, complete surveys or inspections, repair equipment and more, FairLifts can assist you in finding the top offshore helicopter transport service to meet your needs. The crew is the pipeline of the oil industry, supplying the manpower and ingenuity to get the job done. Moving people back and forth be it the crew, company executives, business personnel and even VIPs is an almost daily occurrence, which is why having access to safe, cost-efficient and effective offshore helicopter transportation is a necessity. FairLifts is your go-to service in arranging offshore helicopter transfers, charters from rigs to the mainland and vice versa. Through our vast partner network of offshore helicopter pilots and operators, FairLifts can assist you in arranging regular daily crew transportation in addition to last minute and even emergency helicopter charters. Oil rigs house a cornucopia of equipment. Some equipment is easily managed by one or two individuals while others are massive, requiring heavy lift helicopters to move, place and install. The 24/7 operation of an oil rig also requires a regular flow of cargo to sustain the crew and operations. Offshore helicopter services can provide the heavy lift helicopters necessary to haul large cargo and equipment to and from rigs in the Gulf of Mexico. Oil rigs can be a dangerous place. When an accident occurs and help is needed ASAP, a helicopter provides the fastest assistance. Offshore helicopter pilots are trained to answer the call for emergency medevac transportation as well as assisting in any search and rescue operations. There is a lot to be said for a bird’s-eye view. The vantage point of a helicopter is an essential component of base inspections on oil rigs as well as providing aerial tours for business executives, CEOs, politicians and more. Offshore helicopter charters are the most convenient way to conduct facility tours and base inspections. Running and maintaining a productive oil rig operation encompasses a wealth of off and on-shore services. 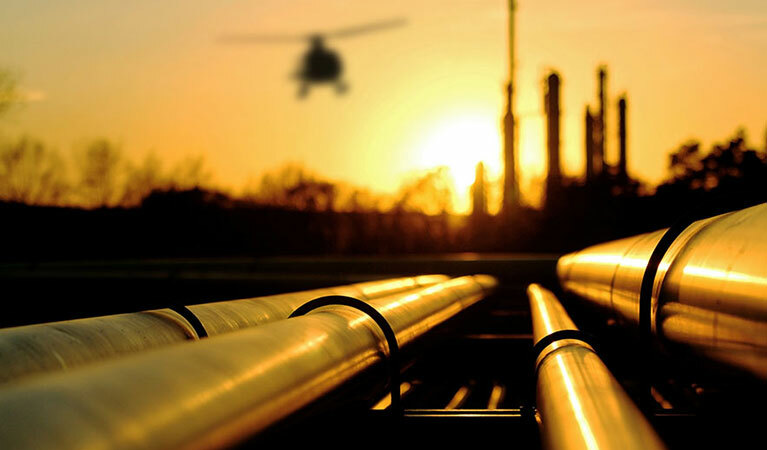 Helicopters are a vital tool in delivering crews to perform critical pipeline surveys, inspections and checks as well as infrastructure examinations and seismic exploration. Many of these reviews are done in the air, calling for helicopter pilots trained extensively in on and offshore helicopter operations. Find the offshore helicopter commercial lifts and charters you need to get to oil rigs in the Gulf. Contact FairLifts for a free consultation with one of our agents experienced in the oil industry to discuss the most effective offshore helicopter transport service your business requires in the Gulf. We can be reached seven days a week by calling 1-800-318-8940 or by using the contact page on our website. An agent will respond in 24 hours or less.